"Reconnect with nature and your body will take care of the rest.This is the beauty of self-healing." Dr. Ann Wigmore. are evident, as sprouts are the most alive of the living foods’. 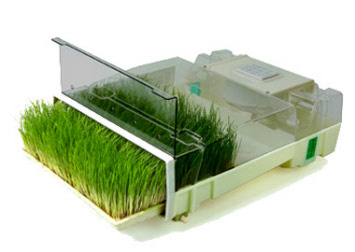 The automatic sprouter by Easy Green tak es the mess out of sprouting. 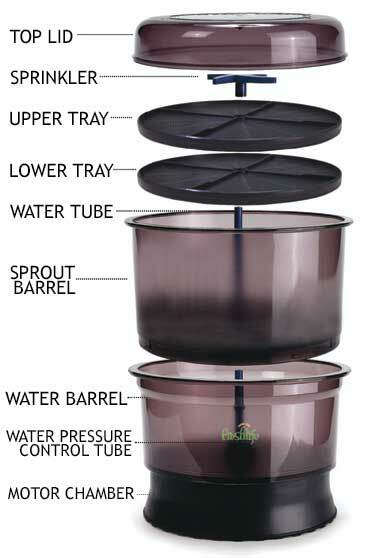 If you love consuming fresh sprouts but have had difficulty with the continuing process required to grow them such as pre-soaking and rinsing (between 3 and 6 times a day), then this sprouter is the perfect compliment to your living food kitchen. The Easy Green sprouter automatically soaks, rinses, mists, oxygenates and drains the sprouts ready for you to eat in about 7 - 10 days. 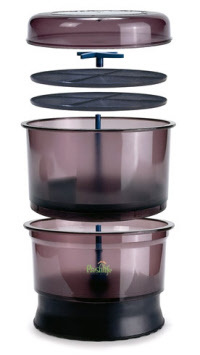 This sprouter has 5 trays so you can sprout an abundant mix of organic sprouting seeds at the one time such as alfalfa, broccoli, lentil, mung, sunflower and wheatgrass. The trays can be placed directly into the fridge. This is the only domestic unit which can easily be turned into a commercial application as the units can be stacked up to five or 6 high. The Easy Green revolutionary sprouting system, now sold in 32 countries around the world, carries a full manufacturer’s warranty. Why are sprouts so good? Sprouts have the greatest nutrient activity of all raw foods. This is because sprouts are actually still in the process of growing. They are at the peak of their life force. The body readily absorbs these nutrients from sprouts, and they are easily digested. This saves your body energy. Because sprouts, or germinated seeds, are pre-digested food, they have what's called a "higher biological efficiency value" than whole seeds, whether raw or cooked. Sprouts also have a regenerating effect on the human body. Why? It's due to the high concentration of RNA, DNA, protein and essential minerals that's found only in living cells. The EasyGreen sprouter automatically soaks, rinses, mists, oxygenates and drains the sprouts – ready for you to eat in about 5 – 10 days. With wheatgrass, unlike other sprouts, a large quantity of wheatgrass is needed to harvest a relatively small amount of juice. For this reason, it is easier to use the large trays. The Easygreen is the only system in the world that can stack up to 5 or 6 EasyGreen machines, making it suitable for growing large amounts of sprout..
* no pre-soaking – automatic rinsing! * soil or hydroponic, the EasyGreen may use both concepts! The EasyGreen sprouting appliance was developed out of the growing demand for organic health food. The EasyGreen’s unique technology empowers the individual to maintain a high potency immune system, by providing natural vitamins, mineral and enzymes that no artificial supplements can rival. The EasyGreen uses a patented technology where mist and oxygen are applied simultaneously to the seeds, thus both cooling and oxygenating the air and water supply. * Sprouts require little water but abundant amounts of oxygen. * Inhibitors in seeds are the natural defense mechanism of the seeds, acting as a deterrent for germs and bugs. * Sprouts are sensitive to environmental conditions and climate changes. * Managing and controlling the humidity within the machine is critical to the sturdiness of the sprouts. The EasyGreen uses a unique 96 activations timer, allowing the grower to finetune the machine to his or her specific environmental conditions. What makes the Easy G reen sprouter so unique? The EasyGreen unit uses about 2.5 litres of water in 24 hours due to its fine misting activity. Sprouters that use an automatic irrigation system need to be plumbed and use large amounts of water. Seeds germinated in conventional sprouting methods such as jars, bags, trays etc. need to be manually rinsed 3 to 6 times a day. The EasyGreen rinses automaticallyas many times as needed a day during the complete growing cycle. Conventional sprouters require a pre¬soaking operation of 8 hours up to 24hrs, before commencing the propagation of the seed. 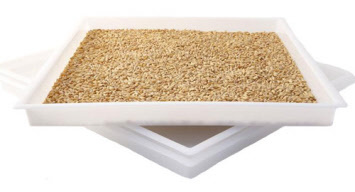 TheEasyGreenrequiresnopre¬soaking.Dry seeds are placed in the tray and the machine takes over; soaking, rinsing, misting, oxygenating and draining automatically, thus saving you time and double handling. Unlike other automatic sprouters, the EasyGreen uses a mist generator. No sprinkles or foggers that will clog and may stop irrigating without the grower being aware. The misting and oxygenating automatic cycles assures quickest harvest, 15% to 40% quicker then any sprouting method. Some growers prefer to use soil for some crops such as wheatgrass or sunflower greens. The Easy Green allows sprouts to be grown in soil and hydroponically. The EasyGreen sprouter uses food grade quality trays and cartridges in accordance with DFA regulations. Most other sprouters use storage containers and trays. Easy Green - easy clean! The EasyGreen has an automatic disinfecting cycle. It is easy to keep high sanitary conditions within the machine. Only large commercial systems have a similar function. Sprouts taken out of conventional systems needs to be placed in a secondary container for refrigeration. Our cartridges with unused sprouts can be placed directly into refrigeration for later use. According to Dr. Ann Wigmore, a 5 day growing cycle for seeds such as alfalfa, broccoli, radish, clover and the similar is ideal. The EasyGreen system is the only one in the market using 5 cartridges, allowing a rotation system by indicating which cartridge is ready for harvest. No need to write dates on each jar or bag! Water in the Easy Green sprouter is only used once so the sprouts are always washed with clean water that is then drained out of the machine. Selecting your water source leaves room for experimentation with natural additives. The water reservoir allows adding minerals that enhances growth, such as liquid kelp, hydroponic growing solutions or solutions that assist in disinfecting the crops, such as hydrogen peroxide. This list gives the popularly sprouted seeds and is not all enclusive as you can sprout any kind of seed. * Wheat is high in Vitamins B, C, and E and has three times the vitamin E of dry wheat. Wheat also has many minerals. * Green Pea sprouts are rich in many of the B vitamins and vitamin C. Green pea sprouts make a rich addition to any green salad. Fenugreek: Rich in antioxidants & flavour. The newest design for starting virtually every sproutable seed. Complete with Mist Generator, Timer, 5 cartridges, Owner's Manual, collection pan, and drain tube. The EasyGreen is easy to use. Just add water and seeds. This tray is useful for wheatgrass & large quantities of sprouts. 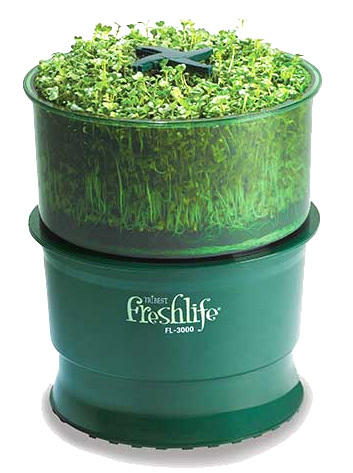 Steve Meyerowitz, known worldwide as the “Sproutman® ," said: “the Freshlife Automatic Sprouter by Tribest is the best sprouter I’ve seen in a long time." This Winter, Remember The Sprouts! Perhaps you have heard about the recommendations of the Ministry of Health that we consume 5 plus portions of fresh fruits and vegetables everyday. If you need help reaching this goal, you’ll get it by including sprouts everyday. It's easy to start up a garden when you enter the wonderful world of sprouts! Not only is it easy, but you will be guaranteed results in a matter of days, not months! Sprouts are baby plants at their prime. According to experts, at this stage of development they have a greater concentration of proteins, vitamins, minerals, enzymes, bio-flavinoids, T-cells, etc. than at any other stage in the life of the plant. Just add water and seeds! No soil, special light, nor a "Green Thumb" needed. Sprinkles water and supplies air. The Seed Trays have two different sized tabs on the bottom and top. The side with the larger sized tabs should always face upward. Upper Tray: Shown w/ Larger Tabs upward. (Laid on top of seeds. Lower Tray: Shown w/ Larger Tabs upward. (Where seeds are spread. Reservoir and supplies water for cultivation. As seen in the drawing, turning the control knob to clockwise will decrease the water pressure and to counter clockwise will increase the pressure. Holds a specially designed pump with a temperature sensor. Allows you to grow twice as many sprouts!